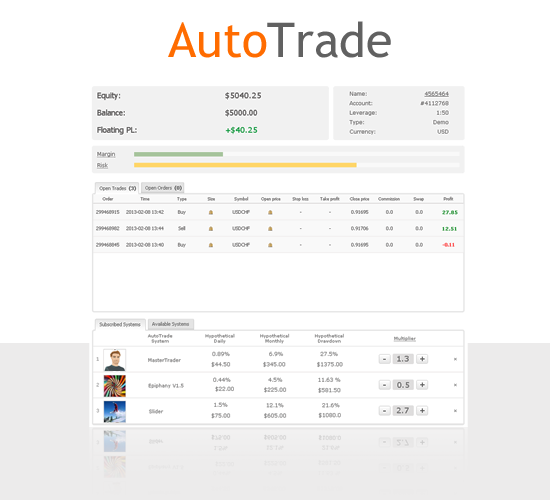 AutoTrade is one of the most advanced copy trading (mirror trading) platforms around with a sophisticated and intuitive web interface. Just as with Myfxbook’s service, AutoTrade is designed from the grounds up to be the most innovative, feature-rich and in the same time user-friendly platform for mirror trading. which you need to browse through, wasting your precious time. which will almost always end up badly for your hard earned money. as with volume based incentives. which are useless and misleading in the real world. which only encourages you to quickly deposit (and lose) your funds. so no need to rent your own VPS or keep your PC running. helping you build your successful portfolio. which trade a real money account. aligning your and theirs interests. helping you to reduce risk and increase returns. so you can move to a live account only when you are ready. so you can relax while trades are copied to your account automatically. The AutoTrade service includes full technical support (by email) for clients at no charge. The client can email the support team directly at support@myfxbook.com or use the ‘Contact Us’ page in the Myfxbook website.